Shane Madolora probably enjoyed the journey from Kirkcaldy to Nottingham more than anyone last night. Panthers’ netminder was the brick wall which stood between Fife Flyers and two points. The game ended 1-1 after three periods, and an overtime penalty call - the only one of the entire night - saw him bolt to the bench for a five on four which allowed Evan Mosey to net a game winning powerplay goal. Flyers took one point for the regulation time tie, but deserved both. There was just a two-shot differential between the teams, but the gap felt wider, and Flyers had their chances to win it. On each occasion they were stoned by Madolora. He made a couple of huge double stops, was alert to several danger points at the back door, and flicked away every puck that came his way. He was, however, pleased with the performance, and the fact his lines created chances as they got into a groove in the second and third periods. The opening period was a bit scruffy at times, particularly in defence where Fife got themselves into a few fankles which Panthers did their best to exploit, but they clearly tightened up and started to emerge with the puck more and more as this game remained wide open. The opening goal came at 15:26 after Tommy Muir didn’t get on to a loose puck. Juraj Kolnik forced a great save out of David Brown, but the netminder could do little to deny Brad Moran as Panthers came back within seconds. If Nottingham edged the first period, Fife more than held their own across the second and third - they had the better chances on the back of a string of good shifts from across the bench. You could reel off the moments, though, that Madolora got a piece on the puck to divert it from his net; Stewart’s tip flashed past, Cullen surging down the right and throwing over a glorious pass which Gunn ought to have buried, Rioux’s rebound shot which thundered into the goalie’s body, Dorr beaten one on one, and then Haines and Dingle forcing a key double save. Flyers did draw level at 24:34 with a smashing goal, curated by Nico Sachetti, whose movement teed up Caig for the finish. 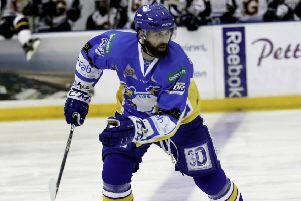 The third saw Fife continue to skate into the immovable object that was Madolora, and that continued deep into sudden death overtime where they created much more than Panthers - just as they did against Caps a week ago. With 2:53 played of the four on four sudden death session, and penalties very much on the cards, referee Alan Craig called TJ Caig for a high stick. Madolora raced to the bench, and before Fife could touch the puck to force a stop, Evan Mosey fired home from close range. It was a tough way to lose a game that was within a whisker of finishing penalty free - a rarity in the EIHL.